I am a bit of a "Bah, Humbug!" girl. 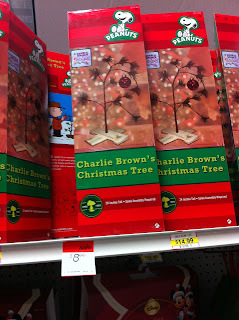 Not because I'm cheap or mean, necessarily, but because the holiday season is not my favorite time of year. If I didn't have kids, I would probably blow off the whole thing and hole up at home to watch all four seasons of Sons of Anarchy. In deference to Roo and Jasper, however, I am trying to get into the holiday spirit. Our sole tradition, started when we moved into the house six years ago, was to buy a potted dwarf pine tree to decorate and then plant it in our yard once the ground thaws in springtime. This past summer was so hot and dry, though, that it killed all of our previous trees. 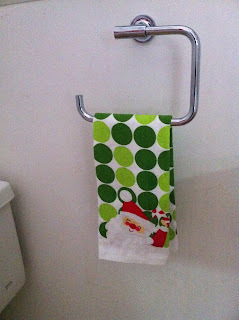 I think we're going to go with a faux pine this year, borrowed from my mom who has somehow gone Christmas decor crazy. I was raised Jewish and my mother has never been remotely interested in home decor, so her obsession with nutcrackers and angels and anything that lights up kind of freaks me out. They have a 15' faux tree that the kids helped grandpa decorate a couple of weeks back but my mom has amassed several others, so one won't be missed. It's not easy to change my ways, especially when all of our family holiday decorations fit into a couple of hatboxes in the pantry. 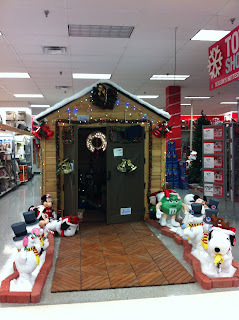 Luckily, I was asked to check out the holiday decor selection at Sears to scope out ideas. They're open extra early in the morning and late at night for your shopping convenience this time of year, so I went right after dropping the kids off at school. 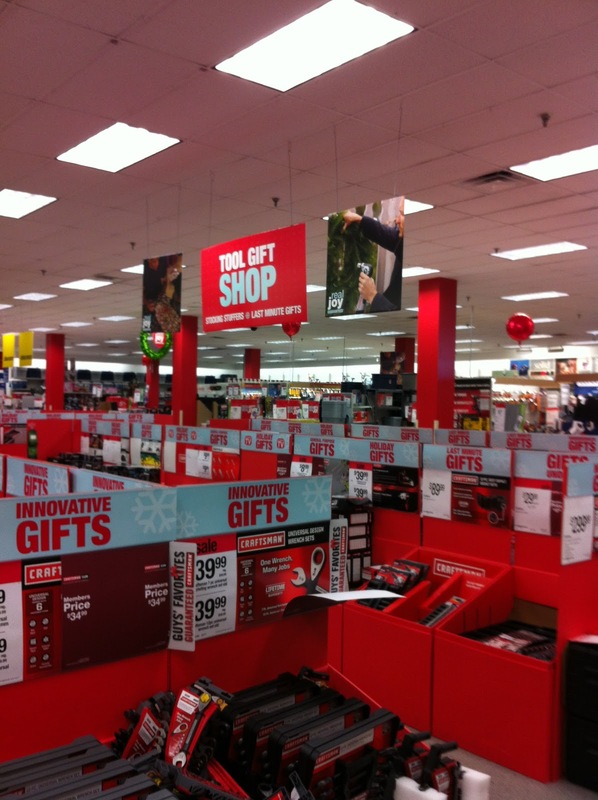 The trademark red Craftsman color always reminds me of Christmas and walking in through the tool department is like entering a winter wonderland. I had to remind myself that I was looking for holiday decor, not gifts. Hard to do in a place littered with bright red temptation on every aisle. Like this saucy Kenmore front-loader set. Please, Santa? 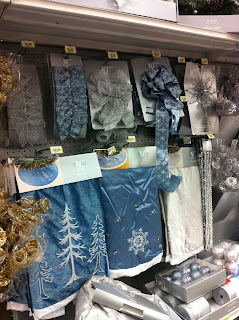 I finally found the holiday nook, a corner of the store dedicated to seasonal finery. 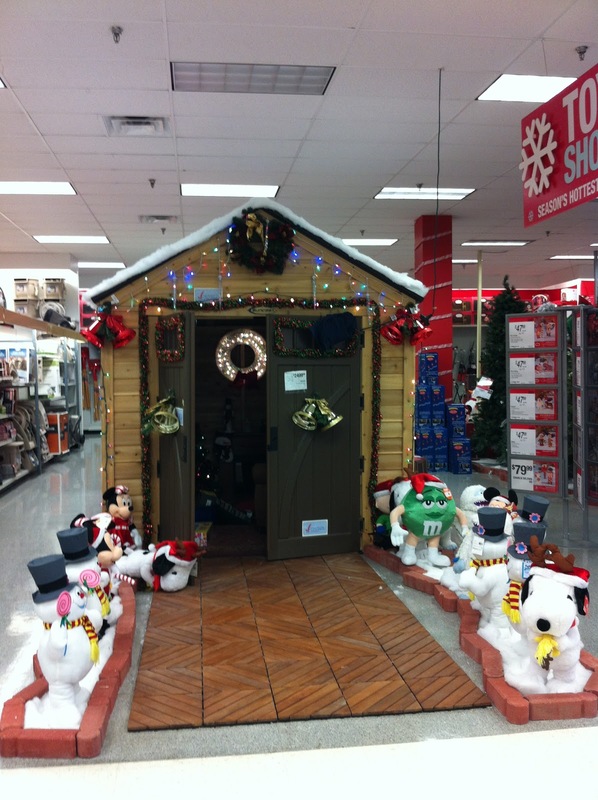 I thought this was the cutest backyard shed, ever, with a greeting line of favorite characters in Christmas gear. 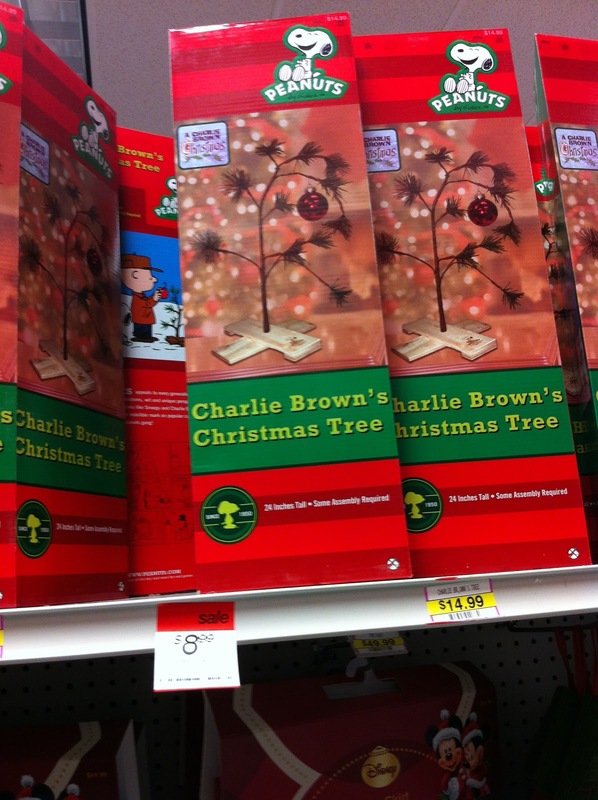 A lot of people are into collectible ornaments and buy special ones every year. These special ones are Christopher Radko for Sears Platinum Shoppe and they're pretty fancy. I'm not sure Jasper's ready for that quite yet. 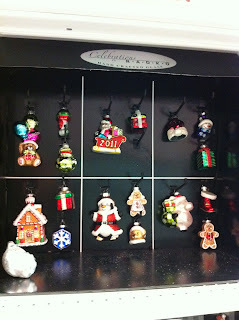 There are plenty of ornament options, obviously, but I didn't expect such well-stocked, color-coordinated collections. 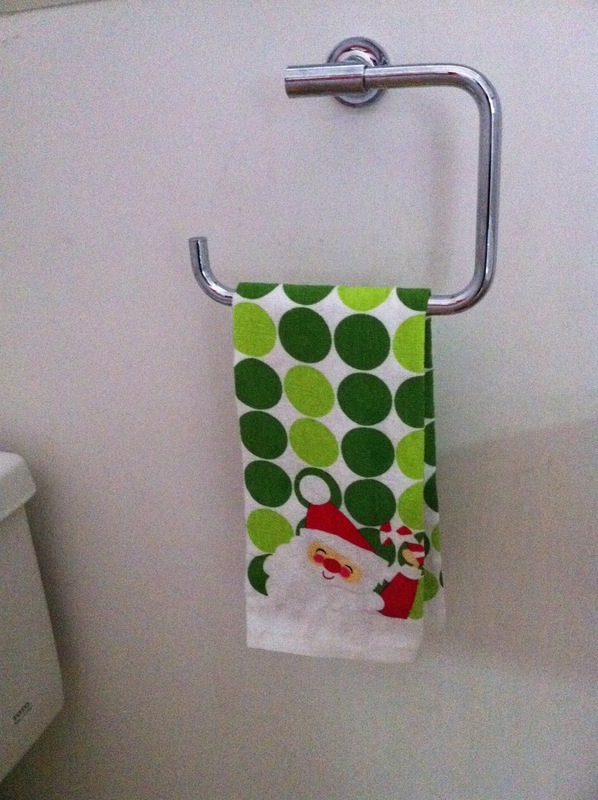 It makes having a decorator-inspired tree a cinch. I like the wintery blue and silver although it's a bit too elegant for our house. 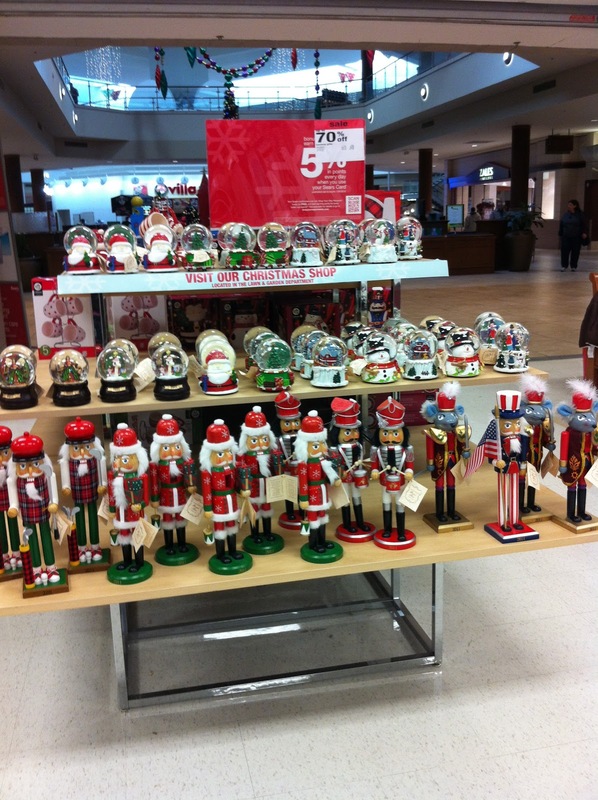 After I plundered the ornament selection, I wandered over to housewares to see if there was any holiday gear there. Of course! Everything from welcoming doormats to hostess aprons. If you collect snowglobes or nutcrackers, here's your display! I have to say my shopping trip was really pleasant, quick and convenient. Now I just have to work on getting everything put together. I am sure my little helpers will love that! 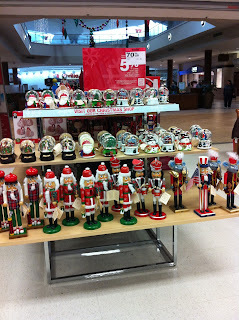 To see exactly how my shopping trip went, check out the play-by-play in my voluminous Google+ album. If you're mall-phobic, you can avoid the crowds and shop from the comfort of your own home any time, day or night at sears.com/holidayshop. If you need extra-added help stoking your holiday spirit, the Sears Cheer Tree can help with hints and stories from their Holiday Cheer Squad and a Cheer Tree mosaic that you can add your own holiday decorating photos to and search for special offers and deals. You can even order fresh live Christmas trees, wreaths and greenery online! I really like what you ended up with. I'm surprised at how much they had there! Well, bah humbug to you, but I can't imagine you won't get into the holiday spirit with that fun haul you bought! Also? I happen to love your towel and I'll also confess it takes a bit for me to feel the holiday "mood", which is definitely easier when focusing on the kids and their excitement. Happy Decorating! You got so much! Great value for the money...hope you finally got into the holiday spirit!